It is unclear if this meant VA 28 began literally at the courthouse in Lovingston and duplexed north with original VA 18. VA 28 may therefore have started up US 29 business Front St, then the US 29 corridor except the SR 770 Cannery Loop up towards Mindus. VA 18-28 used SR 624 Stagecoach Rd to SR 623. This is where VA 28 split north on its own if it wasn't the southern terminus. VA 28 used SR 623 northeast to SR 617 then northeast on abandoned alignment to US 29. VA 28 then cut east on today's VA 6, then north on SR 670 which used to continue past SR 774 to SR 632 then north to US 29 north to Covesville, using Covesville Ln through the community. North of SR 633, VA 28's route was a little to the east of current US 29 using SR 718, a lot of abandoned routing, SR 767 Rabbit Valley Rd. VA 28 follow more US 29 but likely used SR 760 Red Hill School Rd. VA 28 may have used Arrowhead Valley Rd. Near I-64, VA 28 used Teel Ln and on the other side of I-64 picked up SR 702 which becomes US 29 Business. VA 28 followed that to Emmet St. VA 28 then turned right and followed Jefferson Park ave to end at VA 9 (now US 250 Bus) Main St. Adjustments: By 1923, VA 28's southern terminus was definitely the SR 623-624 jct in Mindus. Around 1924, VA 28 was placed on modern US 29 corridor from Covesville to I-64 except it now used SR 779 in the Red Hill area. In March 1924 (CTB), a second piece of VA 28 was created running from VA 17 (now US 33) Ruckersville north 8 miles to almost Shelby via today's SR 645 and US 29. In Jan 1925 (CTB), VA 28 was extended west along Main St in Charlottesville, then north as new routing 9.1 miles, using Rugby Rd and SR 743. In Sept 1926 (CTB), VA 28 piece 1 was extended north another 3.3 miles to now end 0.55 miles inside Greene County. About 1926, VA 28's southern end changed to VA 18 (now VA 6) Woods Mill and VA 28 used VA 6Y and US 29's corridor over to the old route at SR 617. In Oct 1926, VA 28 was given 3 more pieces: VA 16 (now VA 231) Madison northeast several miles via SR 673, US 29 Bus, US 29, a bit of SR 636 at the Robinson River, more US 29, SR 647/607 loop, SR 607/678 through Brightwood (replaced VA 213); VA 37 (now US 522) Culpeper to Rixeyville (also had been VA 213); VA 32 (now US 15 Bus) Warrenton east with VA 21 to Buckland, then replaced VA 211 through Manassas to end at VA 21 (now US 29) Centreville. In late 1926, US 211 was added to the Warrenton-New Baltimore stretch of VA 28. 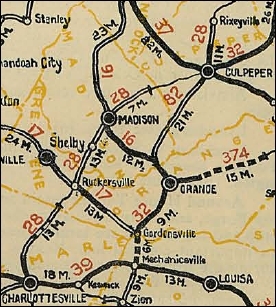 In March 1927 (CTB), the original VA 28 was extended north as new routing 3.5 miles still using current SR 743 to VA 17 (now US 33), then duplexed east with VA 17 to Ruckersville, connecting VA 28 up with its original second piece. In Aug 1928 (CTB), VA 28's Madison piece was extended north 6.8 miles toward Culpeper via US 29 except used SR 631 Kirtley Rd; Mays Ln; SR 717/643 loop near Reva. Also, the Rixeyville piece was extended north 2.5 more miles. Also, the original VA 28 expanded piece was extended 2.15 miles to VA 16 (current VA 230-SR 687 jct) O'Neals Corner, then extended with VA 16 north to Madison which made the original VA 28 segment continuous from Woods Mill to near Culpeper. It appears by 1929 VA 28 was placed on modern US 29 between SR 617 and SR 632 south of Covesville. In Dec 1930 (CTB), the original VA 28 piece was extended north to Culpeper via US 29 and 29 Business onto Page St to Orange to duplex with US 15 through downotown Culpeper, connecting it with the Rixeyville segment. Then VA 28 was extended northeast 3.6 miles from Jefferson towards Warrenton. In 1931, VA 28 was rerouted in Charlottesville to use Emmet St to Main St (replacing VA 715), then east on Main (then-VA 39) to Rugby Rd as before. Also in 1931, VA 28 was rerouted in Culpeper - instead of using Page St to connect with US 15/VA 32/VA 37 Orange Rd, VA 28 now used current US 29 Bus Main St.
Also about 1931, VA 28 was rerouted north of Shelby to use today's US 29 and 29 Business into Madison, leaving behind what is now SR 626 to O'Neals Corner and VA 16 (now SR 687) north to Madison. In 1932, US 29 was added to VA 28 from Woods Mill to Culpeper. In July 1932 (CTB), original VA 28 was extended north to Warrenton, connecting it with the other piece of VA 28. About 1932, VA 28 was removed from SR 616 north of Manassas as well as the Old Centreville Rd alignments up to about Braddock Rd. In July 1933, VA 28 south was truncated to US 29-211 New Baltimore. Woods Mill to Culpepr remained part of US 29. Culpeper to Warrenton was renumbered as VA 29 (today this is Main St, William St, West St and Old Rixeyville Rd leaving Culpeper; VA 229 to north of Rixeyville, then all of SR 802 over to Warrenton). Warrenton to Buckland remained US 29-211 (now US 15-29). This left VA 28 to run on all of today's VA 215, then SR 779, then current VA 28 to Manassas. In Sept 1934 (CTB), a discontinuous floating segment was added, 2.5 miles centered around Herndon. 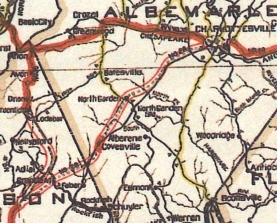 In Aug 1936 (CTB), the Herndon segment was connected north to VA 7. In Oct 1940 (CTB), VA 28 was removed from Buckland and instead sent southwest to its current end near Remington. The old route became VA 295 #2 (now VA 215). The new route replaced part of VA 233 and all of VA 295 #1. In Oct 1953 (CTB), VA 28 was removed from SR 818 in Catlett. In Sept 1961 (CTB), VA 28 was extended north over SR 657 to end at US 50 Chantilly. In Oct 1961 (CTB), VA 28 was placed on new construction in the Nokesville area, leaving behind SR 772, some SR 653, SR 773, and some SR 646. In Apr 1964 (CTB), VA 28 was removed from SR 779 at the VA 215 jct. In Aug 1966 (CTB), VA 28 was rerouted at US 29 Centreville onto newly built highway north to US 50 west of Chantilly, then replaced SR 838 north to VA 7 as it does today. In this action, the Herndon segment of VA 28, which never did connect to the rest of VA 28 was renumbered as VA 228. This also left behind SR 657 up to Chantilly. By 1975, VA 28 was given one-way splits through central Manassas. 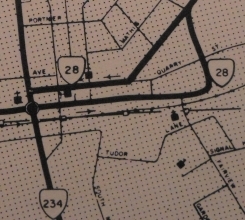 The original route, now NB, used Center St and Prescott Ave. The SB route is shown to use Church St then VA 234 south to Center St. In 1990, VA 28 SB was rerouted in Manassas to use Church St all the way through. 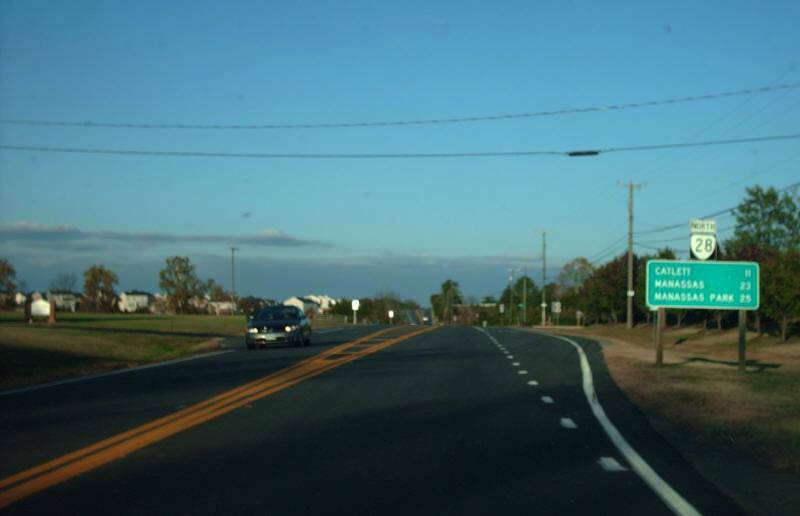 Sometime between 2001-2005, VA 28 was rebuilt in the Midland area, leaving behind SR 878. Improvements: By 1923, VA 28 was paved only around Covesville. By 1925, more of VA 28 was paved from Covesville towards Charlottesville. The only remaining unpaved portion of VA 28 was from Catalpa to the Rappahanock River, which was renumbered VA 29 in July 1933. All other extensions of VA 28 were paved at the time of creation. The first official map to show multilaning on VA 28 was 1966 from Manassas to Manassas Park. In 1990, VA 28 was multilaned from Manassas south to SR 660; Loudoun-Fairfax Line to SR 848 (maps from 1968-89 showed VA 28 as a Super-2 from I-66 to VA 7). In 1992, VA 28 was multilaned fully from I-66 to VA 7. About 2009, VA 28 was multilaned from SR 660 to VA 215. Posted: Fully posted; the last known cutout was on VA 213 which was removed when the VA 28-213 intersection was rebuilt around 2000 or so. Comment:VA 28 provides access to Dulles Airport from I-66 and US 50. VA 28 from Manassas to Remington is largely very rural, but because of two high-profile fatal crashes in the late 1990s that entire stretch was given a 45 mph speed limit which remains as of this writing in 2011. Most of the time that speed feels woefully slow. VA 28 north of I-66 was a literal speedway when I first moved to Northern Virginia in 1995 - even though there were numerous stoplights. VA 28 is just one of two original 1918 routes to remain, although none of the 1918 defined route is still part of VA 28 today.